What word comes to your mind when we mention the name, Zinedine Zidane? The answer...headbutt. It is a somewhat acrimonious response following what was an unbelievable career. Today, we know him as the manager - a leader who led Real Madrid to 3 successive Champions League victories - an unbelievable achievement in itself. The end of his playing career however, was tied perfectly with France's unfancied, yet impressive run to the World Cup Final in Germany. France beat Portugal in the semi-finals and set up a mouth-watering clash against 3 time winners, Italy. In Berlin, the stage was set - two great teams with world class players battling it out to be the best in the world. Step forward Zinedine Zidane. After just 7 minutes, he gave France the lead from the penalty spot. What truly summed up the man was the way in which he did it - a cheeky panenka off the crossbar. Marco Materazzi equalised for Italy and in extra-time, the madness happened. 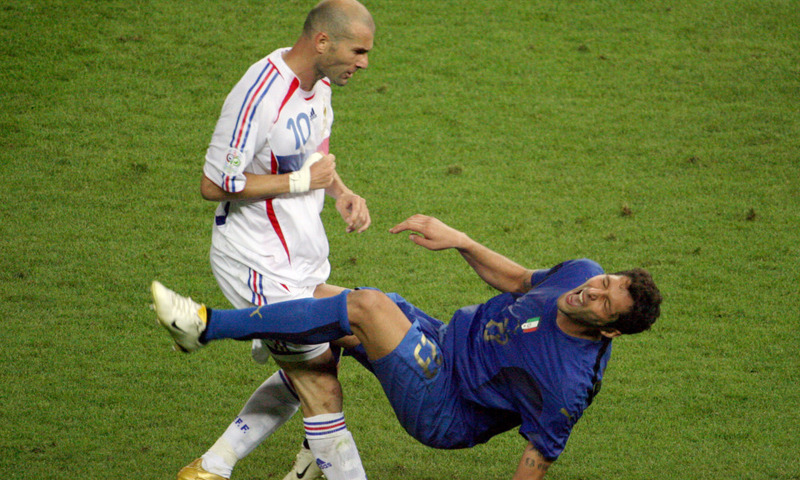 Following a tirade of insults from Materazzi aimed at Zidane in the 110th minutes, the Frenchman turned around and planted a headbutt square on the chest of his Italian counterpart. The millions watching around the world were stunned. In Zidane's last ever game he had been sent off. 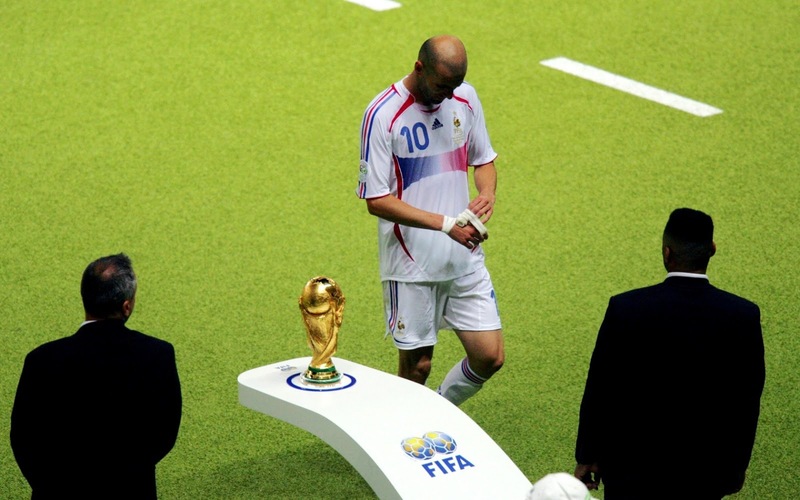 As he walked off unapologetically, he passed the World Cup trophy. There remains something truly poignant about the image. Scandal take place 40 on our list of football's most important moments. This scandal is one Italian football will never, ever forget. The Calciopoli (Footballgate) Scandal was uncovered in 2006 and implicated the reigning Serie A champions Juventus and other teams including Milan, Fiorentina, Lazio and Reggina in a match-fixing network that spanned the previous two seasons. Telephone conversations were recorded as high ranking officials at the named football clubs and the refereeing union collaborated to appoint favourable referees to make favourable decisions for sums of money. Calciopoli rocked European football and very nearly tore the Italian game apart. The punishments, long debated and argued legally, would eventually see Milan deducted 30 points for the 2005/06 Serie A season and 8 points for 06/07. Fiorentina meanwhile were thrown out of the 06/07 Champions League and deducted 15 points for 06/07, Lazio were thrown out of the 06/07 UEFA Cup and deducted 3 06/07 points, Reggina were fined €100,000 and deducted 11 06/07 points. Juventus recieved the heaviest punishments of all the sides. Juventus were stripped of the 04/05 Serie A title (which remains unassigned) whilst Inter Milan given the 05/06 championship. Juve were relegated from the top flight to Serie B and deducted 9 points for the 06/07 campaign. Many believed Juventus would struggle to retain players, having some of the best footballers in Europe who would easily walk into other top sides. However, in the scandal that stretched back to 2004, players insisted they were totally unaware of any match-fixing. Whilst star striker Zlatan Ibrahimović and defenders Lillian Thuram and Fabio Cannavaro left the club, many of their key men decided to stay and earn Juventus' promotion back to Serie A. Italians Alessandro Del Piero and Gianluigi Buffon had won the World Cup that summer but elected to remain with 'The Old Lady' in second tier. They were joined by David Trezeguet and Pavel Nedvěd who helped blood in a group of young players that included Sebastian Giovinco and Claudio Marchisio. begin again for Italian dominance. With Claudio Ranieri appointed manager, Juve would finish third in their first season back and re-qualify for the Champions League. Juventus would take a long while to shake off the stench of scandal. The Old Lady was hit far harder than any of her rivals. Nowadays though of course, Calciopoli is a memory. Juventus have failed to legally reclaim those two titles that were stripped of them but in recent years have added seven consecutive 'Scudettos' to their historic trophy cabinet. Although Italian football will never forget this scandal, perhaps it was a moment that changed the league for the better. Sportsmen and women over the decades have become household names - in fact, at times they have been more famous than politicians, monarchs and television celebrities. Perhaps the most well-known of all footballers is David Beckham. Prior to arriving in Los Angeles, Beckham had never been away from the spotlight. A member of the 'class of 92', he made his name in Sir Alex Ferguson's Manchester United side. Perhaps the source of his fame was his front-page relationship with Spice Girl, Victoria Adams. Never out of the spotlight, Beckham's red card at the 1998 World Cup in France turned public opinion against him. In 2002, now captain of the national team, 'Goldenballs' smashed home a penalty against bitter rivals Argentina to make amends for his error 4 years previous. A multi-million pound move to The Galacticos of Real Madrid followed and Beckham-mania was in full swing. Surprisingly, his stint in Spain was not as trophy-laden as it should have been. A single La Liga between 2003 and 2007 got rumours swirling that he may be off to a new club. At only 32 however and still seemingly at a high level, it came as a surprise when his transfer to LA Galaxy was announced. Just 11 years ago, the MLS was lacking any international publicity and an absence of quality made it unappealing to many a footballer. For Beckham though, the opportunity was incredible. With charities and contacts already set-up across the pond, joining LA was a natural step. From his arrival, the media attention and boost for the league was clear to see. Immediately, sponsorship deals and investments were commonplace in the league. Stadiums and spectatorship rose dramatically - creating, for perhaps the first time, a genuinely glamorous league in the United States. What was more impressive was Beckham's attitude once he arrived. He could have been forgiven for playing out his career in the MLS, but in reality he would go on to win a number of major trophies. 2 MLS Cups and 2 Supporters Shields later, his legacy was secure. This moment truly shows the power of the footballer. We have already seen how tremendously influential the game is as a whole - but certain individuals from within the sport can make a difference by themselves. By using his immense publicity and celebrity status, Beckham delivered a legacy far greater than anyone could have imagined. To this day, the MLS continues to grow and has featured some high profile names - Thierry Henry, Steven Gerrard, Frank Lampard and more recently Wayne Rooney and Zlatan Ibrahimovic. Long may it continue. In part seven of our list we noted the 'dream team' of Johan Cruyff at Barcelona. Cruyff's side and their prosperity had manufactured by an incredibly successful mixture of possession and quick passing. Following this, football styles continued to develop and change. Italian catenaccio had once again been integral to the Milan and Juventus European triumphs, before Real Madrid's team of superstars dominated the continent at the turn of the century. For the Spanish national team however, they had always been the perennial underachievers with constant early exits in international tournaments. In came Luis Aragones - "The wise man of Hortaleza". Spain had reached the final of a major tournament but top goalscorer David Villa would miss out through injury. The BBC believed they could still do it, "Veteran coach Luis Aragones now looks to have put together a side capable of ending the years of under-achievement, even making light of that injury to the influential Villa." Spain would meet Germany in the final with Torres sent out as lone striker as their usual 4-4-2 was adapted to a 4-1-4-1 to cover for Villa's injury and to combat Germany's 4-2-3-1. The change worked, Torres scored the winner in the 33rd minute and La Roja's Tiki-Taka won them Euro 2008 with 9 of their squad selected for 'Team of the Tournament'. Pep Guardiola had been a key cog in the 1992 Dream Team and cites Cruyff as his overall influence. Once he gained promotion to the top seat at the Camp Nou - he was quick to instill his footballing philosophy on the players. The myth that many people believe is that Guardiola was thrown into an already complete team of champions. Not so. In fact in 2008, Barcelona had finished 3rd in La Liga, over 20 points behind bitter rivals Real Madrid. He was quick to train his team with quick passing drills and introduced painstakingly intricate analysis of the opposition. Together with never before seen levels of possession - his side would pass the enemy to death, before attacking with speed and dynamism. They called his tactic - 'Tiki-Taka'. In his first full season as manager, his revolutionary style blew the opposition away. Barcelona won the treble. The peak of the Blaugrana's powers however was in 2011. It is widely accepted that this team is arguably the greatest in history. Rivals Real Madrid attempted to stem the flow of trophies heading to the Nou Camp by hiring Jose Mourinho as gaffer. In the first Clasico since his arrival, we saw one the best 90-minute performances in history. Messi, Villa, Iniesta and Xavi ripped Los Blancos to shreds. Barcelona 5-0 Real Madrid. Alongside Barcelona, the Spanish national team was also continuing to dominate. Going in to the 2010 World Cup they had only lost 1 in 48 matches. The tournament itself showcased once more the effectiveness of 'tiki-taka' on the opposition. Following a fierce and ill-disciplined final, Andres Iniesta struck a late winner. Two years later, the side attempted back-to-back European triumphs. Something, no other nation had done. A virtuoso campaign saw La Rojas reach the final where they thumped Italy 4-0. It was the peak of the Spanish powers and teams would have to totally reinvent their tactics to beat them. This was football at its purest. Football we know and football we love. Football, as we have seen, has had the power to bring people together from all around the world. The game quickly became incredibly popular in Europe and South America, before spreading to the other continents of the world. The modern history of Africa however, has been full of exploitation, dictatorial governments and poverty. When South Africa won the right to host the biggest competition on Earth, it was sure to raise a few eyebrows. 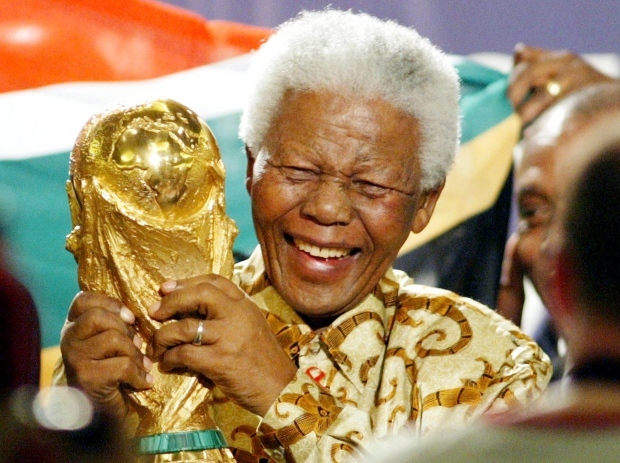 For most, it was the culmination of twenty years of growth in African football. As FIFA continuously expanded and the World Cup grew to cater for more sides, African sides, for the first time, were given a platform on the biggest stage of all. Despite Egypt's appearance at the 1934 tournament, the former colonisation of the African continent meant it would be another team qualified. This time Morocco. Subsequent performances from nations like Zaire failed to make much of an impact, until the 1990 World Cup. Cameroon's run to the quarter-final that year earned the respect and praise of people all around the world. For the first time, Africa was being noticed. The star of the show was Roger Milla. At 36, he had scored three goals to help his nation progress. In 1994 and 1998, the progression of African sides continued with the Super Eagles of Nigeria impressing many in the latter. By now the tournament was catering for 32 teams, of which 5 would be from Africa. In the opening game of the 2002 World Cup, relative unknowns Senegal beat holders France 1-0. Overnight, Senegalese heroes Diouf, Diao and Diop were household names. The time was right then for an African nation to host the competition. FIFA had put vast amounts of money and resources into the continent in the years leading up to it, and now was the chance to showcase it to the globe. The stadiums, fans and locations helped create a marvelous atmosphere - a true carnival of football was about to begin. As we have already stated in moment 44, Spain would go on to win the cup after a final which featured 14 yellow cards and 1 red. In hindsight, the 2010 World Cup will not be remembered for the football (In fact, the overall quality was actually rather poor), but it will be for what it meant to an entire continent. It showed that football truly is a universal game for everyone. It showed that it has the power to inspire people, no matter what their social-economic situation dictates. Football truly is the world's language.